They are in the Price calculator menu for each service. 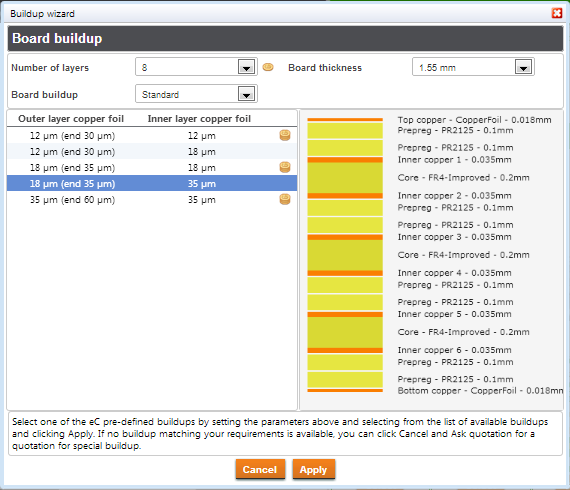 To access them, enter the number of layers and board thickness you want and then open the build wizard by clicking on Select pre-defined multilayer standard builds. The wizard shows the standard build for the layer/thickness combination you have selected plus the available copper thicknesses. We also offer up to 8 additional pre-defined multilayer standard builds for each layer/thickness combination with different core thicknesses and the reversed build options typically used for blind vias. Not all layer/thickness combinations can have as many as 8 pre-defined builds, particularly for thinner multilayers. The standard pooling thickness for multilayer PCBs is 1.55mm. STANDARD pool offers 3 different copper combinations for outer and inner layers (PCB proto and RF pool have one only). These combinations are available at low pooling prices. Other combinations are marked by the coin stack symbol . These are not ordered sufficiently often to be poolable. So they are supplied as non-pooled options on a whole panel basis.